Scarlett Johansson plays Major and Chin Han plays Togusa in GHOST IN THE SHELL. ©Paramount Pictures. HOLLYWOOD—Adding to her growing roster of strong, self-reliant characters (“Avengers’” Black Widow, Silken Floss in Frank Miller’s “The Spirit,” the title character in “Lucy”), ubiquitous actress Scarlett Johansson takes on another big screen heroine, Major, with “Ghost in the Shell,” based on the Japanese manga by Masamune Shirow. 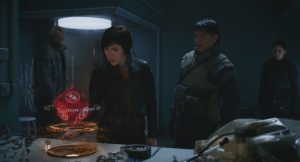 As Major, Johansson is a special ops, one-of-a-kind human-cyborg hybrid, who leads an elite task force called Section 9. Devoted to stopping the most dangerous criminals and extremists, Section 9 is faced with an enemy whose singular goal is to wipe out Hanka Robotic’s advancements in cyber technology. As she faces this formidable new enemy, Major also discovers some hidden truths about her past. The 32-year-old actress spoke about tackling the beloved manga story, eyed for a multi-picture franchise, and wearing that form-fitting costume. The sci-fi action adventure is directed by Rupert Sanders (2012’s “Snow White and the Huntsman”) and written by Jamie Moss, William Wheeler and Ehren Kruger. Q: How would you describe Major? Johansson: She is the head of a government-funded group, section nine who fight cyber-terrorism, which she believes to be humanity’s greatest threat. Through this journey of fighting terrorism, she embarks on a path of self-discovery in a very unexpected way. Q: What can you say about your form-fitting Thermoptic Suit? Johansson: The Thermoptic Suit is sort of like a second skin and it allows her to become invisible and everything that goes along with that. It’s a tool she uses to be (on the offensive) and obviously to be undercover. There are other characters in the film that have the same technology— maybe not as advanced—but it’s not something that’s like a super-suit. It’s just something that is out there. We know that the material exists and it’s something that allows her to fight under the radar. Q: And look good while doing it. But Major has skills that don’t come from the suit? Johansson: Yeah, the skills she has are her own. It has nothing to do with wearing the suit. Q: How does technology affect the “Ghost in the Shell” world? What is the world of the film like? Johansson: I don’t think it’s an alternate universe but I think it’s what I would describe as the not so bright, not so distant future. Humans are still able to use technology to their advantage but, in becoming so dependent on technology for their own satisfaction, enhancement and happiness, they have sort of forgotten or are losing a sense of purpose, a sense of self and connectivity, all those things. It’s a world that is sort of isolating and sterile. Q: What can you say about the fight sequences and the physicality of the role? Johansson: It wouldn’t be “Ghost in the Shell” without the crazy fight sequences and gunplay. It’s been exhausting and really empowering at the same time to be able to be as physical as I have on this film. I’ve been really able to handle weapons, complete every fight, do all the wirework with the support of the stunt team leading, guiding, supporting me and cheering me on. Q: That’s you doing nearly all your stunts, right? Johansson: Yeah, because the physicality is such an important part of this character, I’ve been really married to the idea of doing everything and being as capable as possible. It’s really been something else for me. I feel that I now have a set of skills for life. (She laughs.) It’s allowed me to get over a lot of the fears that I’ve had; feeling out of control but realizing, “No, you are in control. You’ve got this and you can make it look ****** too!” It’s been really empowering. Q: How does she actually find herself? What is her personal quest? Johansson: Rupert (Sanders, the director) and I talked a lot about the plight of this character, the quest for self-identity, the need to know the truth about where you come from and what that means. Are you a product of where you come from, who you truly are from your experience, and is that what makes you you? If not, what does? The fact that Major has a life she believes she had, a life she’s been given and a life she chooses, that journey was exciting for me to pull apart. Q: What was your overall experience playing Major? Johansson: This experience has been like nothing else I’ve ever had before. It’s really been all-encompassing and I feel I’ve taken on this character in a way that was very unexpected. It’s hard to shake, and I hope the audience shares the same compassion that I have for this character. I hope they willingly go on this ride with me because it’s a ride for sure.